It is always good to have some artwork to show for a new year! Here is an UDK run time update on my personal project N.O.A. Scrolled down now to the video if you want to skip the wordy post! The concept is that N.O.A is a parallel world of ours which was destroyed by a great flood in 2012. We would discover it in 2020 and manage to capture and record light from this parallel dimension. 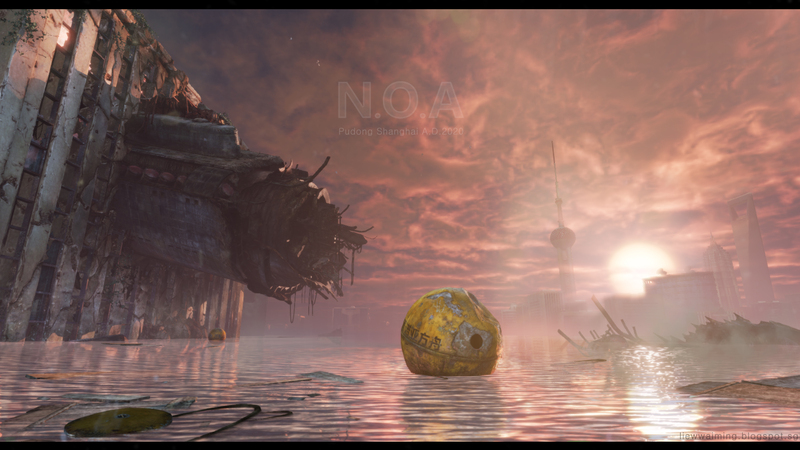 The above video shows the aftermath of the flood in Pu Dong, Shanghai, in the alternate world N.O.A. In this scene, some wealthy people managed to get hold of a decommissioned World War II submarine and hoped to survive the flood. There are also others who used flood rescue pods. None of their fates seems optimistic. I decided to create this scene in Unreal Engine mainly because i have been using it during my LucasArts days and got accustomed to the mostly WYSIWYG aspect of making art work in real time environment, especially lighting. It does come with other less desirable process such as optimisation and lightmap issues. But I wanted to find some ways to make it work for my personal art. As of now, i still think pre-rendered stuffs have the upper hand in terms of lighting quality. I am looking forward to see how things in Unreal 4 progresses. As always, uploaded videos get compressed. It is a pity the caustics on the submarine body does not show up well even at HD on youtube. At times like this, i wish i can just share my screen live on the blog. Here is a Unreal run time video to end the post.